Hurricane Irma is making its way thru the Caribbean, where it will or if it will hit the United States is still up in the air. Hurricane Irma has strengthened to a Category 5 storm with maximum sustained winds near 175 mph as it approaches the northeast Caribbean on a path toward U.S.
“Extremely dangerous” Hurricane Irma strengthened to a Category 5 storm Tuesday morning, the National Hurricane Center said, with sustained winds of 175 mph. The hurricane will blast the northern Caribbean with flooding rain, damaging winds and rough surf over the next few days, AccuWeather warned, bringing life-threatening conditions to the islands. A similar scenario could play out somewhere along the Gulf or East coasts of the United States this weekend or next week, depending on where Irma tracks. The storm could hit Florida, Georgia or the Carolinas, or even head into the eastern Gulf of Mexico. Irma is now the strongest hurricane in the Atlantic since 2007. When a Category 5 hurricane hits land, “a high percentage of framed homes will be destroyed, with total roof failure and wall collapse,” the hurricane center said. UPDATE I: Hurricane Irma prompted the governors of Florida and Puerto Rico to declare states of emergency Monday. Florida Gov. Rick Scott’s emergency declaration mentions that weather models predict Irma will “head into the Straits of Florida as a major hurricane,” then “travel up the entire spine” of the state. The declaration — which applies to all of the state’s counties — also outlines an emergency response plan, including potential policies such as waiving fees on toll roads, activating the National Guard, and setting up shelters in public buildings. In Puerto Rico, Gov. Ricardo Rosselló also declared a state of emergency, saying that Puerto Rican officials have issued price freezes on basic necessities, and that the US territory has 456 shelters that can accommodate 62,100 people. UPDATE II: Hurricane Irma leaves trail of death, destruction across Caribbean. Hurricane Irma left a trail of death and destruction across the Caribbean on Thursday as the Category 5 storm howled past Puerto Rico and headed toward the Dominican Republic and Haiti on its way to Florida. At least 10 people have died and authorities are struggling to get aid to small Caribbean islands devastated by the storm’s record 185 mph winds. Barbuda’s prime minister called the island “barely habitable” and St. Martin, an island split between French and Dutch control, saw extensive damage and was completely destroyed in places. French Interior Minister Gerard Collomb told France Info radio that the toll on Saint-Martin and Saint-Barts be higher because rescue teams have yet to finish their inspection of the islands. Harvey is the flood of a lifetime. The rain just keeps coming and coming and coming. 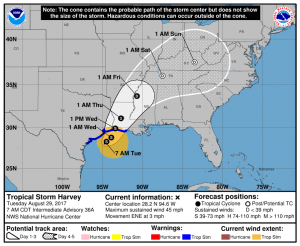 Area of Southeast Texas have been devastated by Tropical Storm Harvey, with some areas drowning in nearly 40 inches of water. Some parts of the state are bracing for another beating with up to 20 inches of rain. 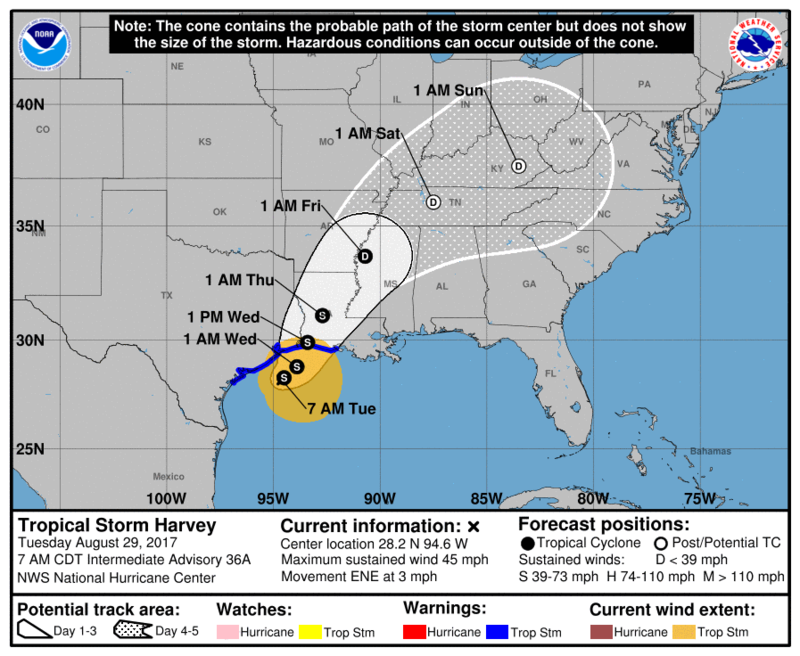 Forecasters say Harvey, which made landfall in Texas as a Category 4 hurricane on Friday night, will move slowly to the northeast throughout the week and shower some parts of the state with another 15 to 20 inches of rainfall by the end of Thursday. 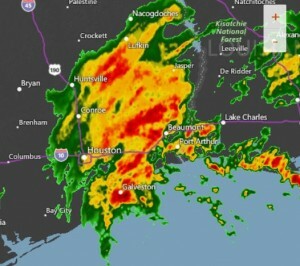 Certain areas to the west of Houston could see as much as 50 inches of rain by the time the storm is over — which would be the largest recorded total in Texas history. By Monday, more than 2,000 victims in Houston had been plucked from the catastrophic flooding, which left roads, homes and cars across Texas submerged in water. The death toll has rose to 14 as tragically family of 6 believed dead as their van was sept awaty trying to flee the flood waters. Six members of the same family are believed to be dead after their van was swept away in floodwaters caused by Tropical Storm Harvey over the weekend, Houston-area television station KHOU reported Monday. Two adults and their four great-grandchildren were trying to escape Sunday afternoon when their van was overcome, three relatives told the station. The children’s great-uncle, who was driving the vehicle, managed to crawl out before the vehicle became fully submerged in water, KHOU reported. Hurricane Matthew hits the Bahamas and headed toward Florida. Matthew has already been responsible for 26 deaths (updated now to 39) as it heads toward the East coast of the United States. Gov. Scott warned Florida could be facing its ‘biggest evacuation ever’ after declaring a state emergency. 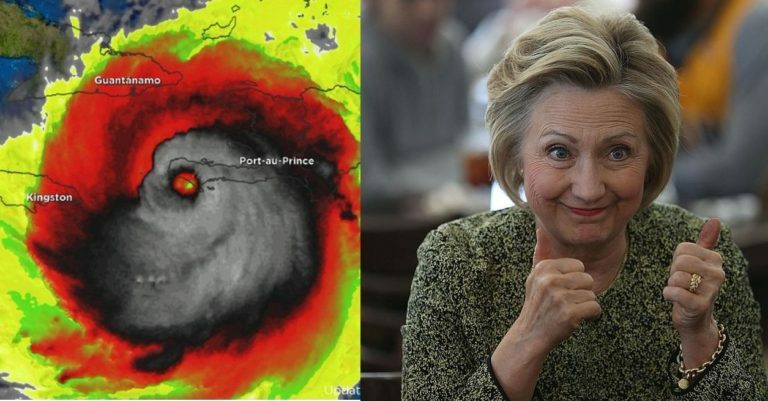 Matthew is supposed to be a CAT4 hurricane when it hits the U.S. Please take the evacuations seriously. More than two million people in the US have been urged to evacuate their homes amid warnings Hurricane Matthew is strengthening and could cause ‘loss of life’ as it bears down on the East Coast. Thousands of families have been caught in gridlock in Florida, the Carolinas and Georgia after fleeing their homes ahead of the storm – which is expected to strike Miami at around 2am on Friday and crawl northwards. The powerful category-three hurricane, the fiercest Caribbean storm in nearly a decade, has already killed at least 22 people in Haiti and four in the Dominican Republic on Tuesday. It is expected to intensify to a ‘catastrophic’ category-four hurricane when it batters southern Florida and moves further up the Atlantic coast into Georgia and South Carolina, the US National Hurricane Center said. The National Weather Service has advised that ‘loss of life’ and ‘immense human suffering’ is possible for those who don’t take precautions. The Weather Channel: Hurricane Matthew’s U.S. Impacts: Life-Threatening Storm Surge, Damaging Winds, Flooding Rainfall. Hurricane Matthew will hammer parts of eastern Florida starting Thursday, and then spread up the coast of Georgia and the Carolinas Friday into the weekend. As illustrated by the National Hurricane Center’s (NHC) projected path map, and also explained below, the severity of any direct impacts will depend on how close the center of Matthew moves near the coast. An important point to make is that landfall does NOT need to take place for the worst impacts to come ashore. The strongest winds and most drilling surge will come to the coast in the eyewall, which surrounds the eye. Landfall occurs when the calmest portion of the eye, or the center, comes ashore. Hurricane conditions could come ashore even if the center stays 20 to 30 miles offshore. Millions flee as Southeast U.S. braces for deadly Hurricane Matthew. Matthew, which killed at least 39 people and displaced thousands, mostly in southern Haiti, was predicted to strengthen from a Category 3 to 4 storm en route to Florida’s Atlantic coast. Landfall was expected there on Thursday night, the U.S. National Hurricane Center said. A 225-square-mile “debris field” was discovered by crews looking for signs of a cargo ship carrying 28 Americans that vanished during Hurricane Joaquin — a frantic search entering its fifth day. The Coast Guard said it had scoured 70,000 square nautical miles of the Atlantic as the search resumed at daybreak Monday. Three more Americans were identified among the 33 people on board the El Faro container vessel, which hasn’t been heard from since Thursday. A distress call indicated it had lost power and was taking on water as it sailed through the Bahamas at the height of the hurricane. South Florida men Jeremy Riehm, 46, and Steven Shultz, 51, were named by their families as among the missing, according to NBC affiliate WBBH. A third American was identified as Keith Griffin. CNN: Coast Guard finds debris field in search for El Faro. Sadly, the fact that the US Coast Guard has found an oil slick in the debris field may mean that the ship broke apart. The U.S. Coast Guard reported Sunday evening that it had discovered a 225-square-mile debris field in the Caribbean Sea during its search for missing container ship El Faro. The Jacksonville, Florida-based El Faro, which was carrying a crew of 28 Americans and five Polish nationals on its way to San Juan, Puerto Rico, went missing near the Bahamas last week as Hurricane Joaquin, with winds blowing at 130 mph, passed over the archipelago. Sunday’s discovery of the debris field, which consisted of Styrofoam, wood, cargo and other items, according the Coast Guard, came only hours after the agency said searchers had found “multiple items,” including an oil sheen, life jackets and containers in the same search area.